“We Can Do It!” is a WWII-era propaganda poster created for Westinghouse Corporation by artist J. Howard Miller, and has in the years since become a pop culture icon commonly interpreted as an image of Rosie the Riveter. Although little-seen during WWII, this poster is much-celebrated in our time, and its popularity continues to grow as it appeals to new generations. And although not originally labelled in any way as “Rosie the Riveter” the “We Can Do It!” gal has now become arguably the most well-recognized and definitive image associated with Rosie the Riveter. Many news outlets have memorialized Michigan war worker Geraldine Hoff Doyle as the inspiration for the famous “We Can Do It!” poster. These news stories relate that Mrs. Doyle recognized herself in a 1942 UPI press photo of a female worker wearing a polka dot bandanna, a photo that had been posited as the possible inspiration used by Miller in creating his famous poster. But what if I told you that inspirational photo is not of Geraldine Hoff Doyle, who has sadly passed away, but a photo of war worker Naomi Parker Fraley, who is alive and well and living in California? I bet you’d be as happy as I am to know that “the real Rosie the Riveter” is still with us! Of course, there’s more than one WWII gal who can lay claim to the title “the real Rosie the Riveter,” meaning she played a critical role in defining the iconic character. Most often cited is our own Rose Will Monroe of the Willow Run Bomber Plant, famously featured as “the real-life Rosie the Riveter” in WWII short films promoting War Bonds. Then there’s Mary Doyle Keefe, who, though neither Rosie nor a riveter, was the live model for Norman Rockwell’s well-known 1943 “Rosie the Riveter” cover for the Saturday Evening Post. During WWII, then as now, the public and press were always on the lookout for a real-life gal that they could think of as “the REAL Rosie the Riveter.” So when Rose Bonavita and her partner shot a record number of rivets on the night shift at an aircraft factory, she was, of course, hailed in the press as “the real Rosie the Riveter.” And, soon after the release of the wartime hit song, “Rosie the Riveter,” the press went looking and found patriotic debutante Rosalind Palmer Walter working in an aircraft factory, and dubbed her… you guessed it… “the real Rosie the Riveter.” Real Rosies, all! 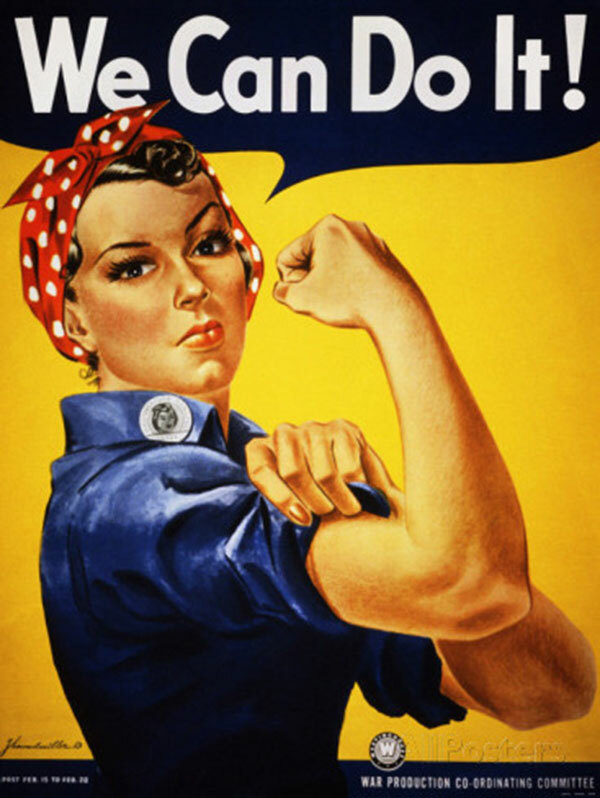 The famous UPI photo said to have inspired the “We Can Do It!” poster. The photo depicts Naomi Parker Fraley. For many years, Geraldine Hoff Doyle was routinely included in this group of “real Rosies,” whose face was the inspiration for the “We Can Do It!” poster which has become so strongly associated with Rosie the Riveter. This connection had its genesis in 1984, when Mrs. Doyle saw a reprint of a UPI photo (pictured at left) of a young war worker in polka-dots in Modern Maturity magazine and “recognized herself” in both the photo, and the poster (which was in the process of being rediscovered and gaining fame throughout the 80s.) Mrs. Doyle had worked briefly during WWII at American Broach in Ann Arbor, Michigan on a metal press machine, and recalled that one day a news photographer snapped photos of her working… and she was certain this was one of the photos. Overeager journalists picked up the story without fact-checking the identity of the young woman in the photo, which was probably much harder to research in the pre-internet 80s and early-internet 90s. Since Mrs. Doyle never claimed to have met or sat for J. Howard Miller, but only claimed to recognize herself in the UPI war worker photo… and since the UPI photo is proven beyond a doubt to depict Naomi Parker Fraley, we must conclude that Mrs. Doyle cannot be the inspiration for the famous poster. That claim to “Rosie” fame now transfers to Naomi Parker Fraley. Mrs. Fraley recalls her father walking her down to the Alameda naval air base in early 1942 to apply for a war job. He told her that she needed to do her part for the war. She was part of a vanguard of 50 women hired to work in the machine shop there, with plans to soon hire 300 more. Shortly after she was hired, in April of 1942, Alameda was where the USS Hornet docked to load up the 16 B-25 bombers that were soon to take part in the famous Doolittle raid on the Japanese mainland. “We Can Do It!” is a beloved cultural icon. The press and public interest in putting a real face and name to the iconic character of Rosie the Riveter remains high, as evidenced by the frenzy of interest in Mrs. Doyle’s passing in 2010, and the passing of Rockwell’s sitter, Mary Doyle Keefe in 2015. How much more satisfying to celebrate one of these “real Rosies” who played a critical a part in defining the beloved icon, while she is still with us, as Naomi Parker Fraley is, and can share her recollections? The idea of a possible or likely real-life inspiration for “We Can Do It!” gal has taken hold of the public imagination and resulted in a flood of news articles over the years. The erroneous identification of Mrs. Doyle as the subject of the photo, and therefore inspiration for the poster, has been reported as fact on NPR, the New York Times, the UK Guardian, the Washington Post… and continues in news articles still to this day. It seems important to correct an error regarding something that is clearly very important to people. If anyone is to be credited as Miller’s inspiration, it is Naomi Parker Fraley, and the best part is she is still alive to share her experiences with a generation that is keenly interested! I’ll be the first to admit that the relationship between the UPI photo and the famous poster was only ever conjectural, and we will never know for sure since J. Howard Miller died before anyone could ask him. But as to the identity of the worker in the UPI photo, case closed, so let’s set the record straight where we can. With members of WWII’s Greatest Generation lost every day, and young girls daily looking up Rosie the Riveter and “We Can Do It!” for inspiration and to write reports, it’s important to get the story right. 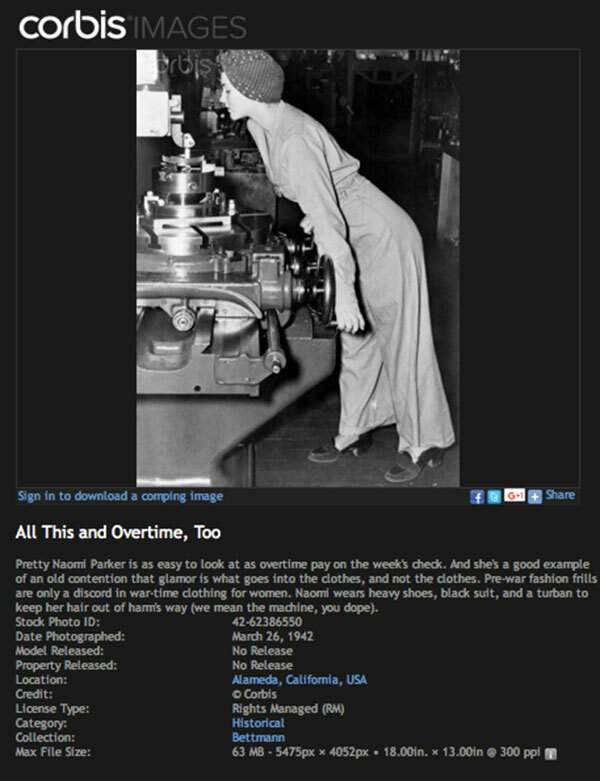 Many WWII Rosie the Riveters Are Still Among Us… Let’s Celebrate Them! Naomi and Geraldine… and Mary, Rose, and Rosamund…and Ruth, Ada Wyn, Marj, Vivan, Mallie, Shirley, Frances, Rachel Mae, Cookie, Angeline, Eva, Elma, Pauline, Margaret, Loraine, Helen, Betty & Lenore, Blanche, Louise, Mary Lou, Carol… the list goes on and on! They’re in their 90s now, but they are still among us, with wisdom to share and stories to tell. I’ve had the pleasure of meeting so many, and love them all. You will, too! Get together and find these women in your community and celebrate them. Thank them for their service on the Home Front, and for breaking down gender barriers so your daughters can choose any career they wish. Ask them what they were doing when they heard about Pearl Harbor, and what it was like to live through a time when the whole world was at war. Ask them what it was like to be young then, and what they did for fun. You’ll never regret taking time out to honor your heroes. Learn about the nationwide effort to save Rosie’s legendary Willow Run BomberPlant here. Socialite and philanthropist Rosalind Palmer Walter is still alive and head of an eponymous charitable foundation, and she sits on the boards of many prestigious organizations. Rose Bonavita Hickey was interviewed in the 1980s about her experience as a record-setting riveter and her return to homemaking after the war, and you can read her bio here. To read some amazing stories from living Willow Run and Detroit WWII Rosies, click here.